There have been many comments about insufficient on-street car parks and the original number of parking bays that were provided by the developer/Council. A number of these bays have been lost due to driveways to individual properties being placed across these areas. In addition, there have been changes in the Master Plan, such as including additional dwellings, without increasing the provision of additional on-street parking. The issue of on-street car parking is a vexed one and obviously many residents have strong opinions about this. 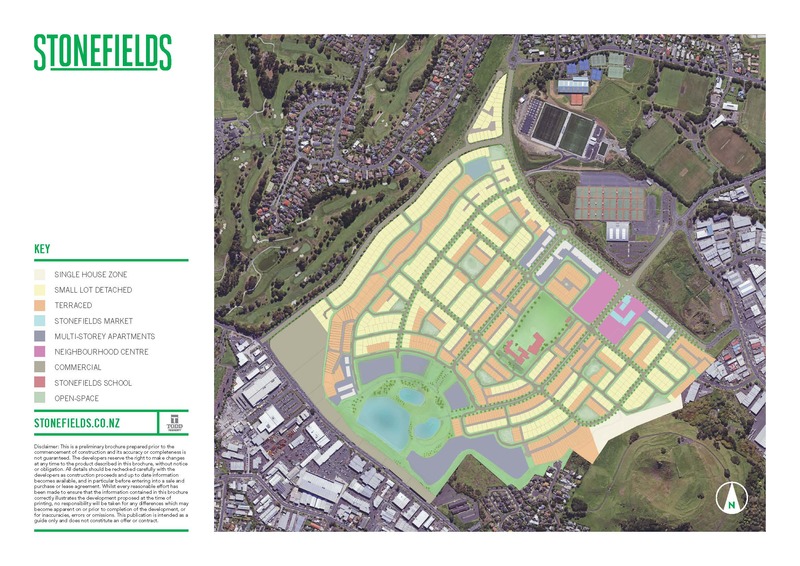 However, whether we like it or not, the Council decided to implement wide landscaped street berms and narrower vehicle carriageways when it initially zoned the land, and this is a part of the streetscape and urban form that eventuated in Stonefields. The road design was a conscious decision by the Council to introduce a different urban design pattern to road networks with a focus on a more park-like road environment and promoting slower vehicle speeds. Coupled with this was a deliberate decision to include rules that required development to be set back to encourage off-street car parking within properties. It is worth noting that this approach to urban design is being repeated and implemented in other new residential subdivisions in the Auckland region. On-street car parking was provided within the landscaped berms at a ratio of approximately 1 space per 5 dwellings. Generally people like the provision of landscaped berms and do not generally want them to be replaced with more on-street parking, especially when residents are choosing to park their cars on the street rather than in the garages on their property. However, I am not opposed (nor is the SRA) to more on-street parking in areas where mostly terrace houses are built and the ability to park off-street is less available. As a residents group we are looking for opportunities where we can work with the Council to increase these off-street spaces. It is important to note that the responsibility of providing more car parking spaces on the street does not rest with Todds, the developer. The road was vested with the Council several years ago (when subdivision first took place) and as such the problem now lies with the Auckland Council (being Auckland Transport who is the owner of the land and the roading control agency). All the roads are now formed and fully vested. We are aw are that the configuration of the on-street parking spaces does not align perfectly with the lot distribution in Stonefields and as a result, several off-street parks are actually formed over driveways. The SRA is currently raising this with Todd Property and the Council, as there is a “deficit” in the number of spaces that can be used as a result (we estimate at least 30 spaces). As an Association we agree that those on-street parking spaces lost to driveways should be replaced and that the Council should undertake this work. With regard to apartment developments, we plan to keep an eye on all new developments to ensure that adequate off-street parking is provided, for both visitors and residents. We are also supportive of the Council’s new public transport initiative, which will soon see more regular train services (we understand that these involve 15 minute services to the City) and similar feeder services by bus. Obviously this will take time but we think it is step in the right direction.